You are currently browsing articles tagged Church Growth. When it comes to progress in evangelism, I like to celebrate as much as any other believer. I’m not one to criticize any effort especially when, looking at current trends, so little is being done. Still, I’m not content to simply celebrate, I want to evaluate as well. I want to ask the questions of myself and my students that will help us maximize our effectiveness as we share God’s story, the gospel, with our families, friends, and neighbors. I feel there is a tendency to assume certain conditions are present as we address nonbelievers, but although those conditions may be felt generally throughout the society, each individual’s needs may be radically different. That’s why, when we share God’s story with individuals, it’s so much better to know where they are coming from before we try to direct them in the way that they should go. That same class, I had the pleasure of directing my students to the Engel Scale of Receptivity. This tool will enable them to quickly assess the spiritual need and accommodate their message so that this who receive it can understand and take positive steps toward discipleship. I hope you find it useful as well. Its my prayer that these steps of evaluation, combined with useful tools, will encourage all of us to continue to share the gospel in an increasingly effective manner. Have you taken time to evaluate your involvement in the work of evangelism? What have you found? 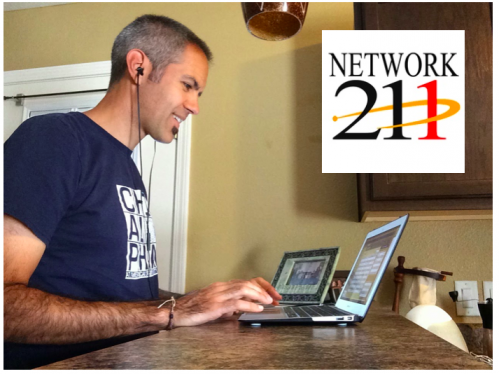 Are there any tool that you have found to be helpful in sharing your faith? Let us know where to find them! I love a great adventure. As a youth, I remember traveling off to distant lands with the aid of the latest edition of National Geographic. As a missionary, I’ve been blessed to visit some of those places that I had once only read about. I’ve marveled at the volcanoes of Costa Rica, and navigated through the waters of the “Cañon del Sumidero” in the Mexican State of Chiapas. I’ve entered the ruins of the ancient Maya civilization and slept in the thatched homes of their descendants. Still, to tell the truth, although travel remains a highlight of what we do, I gain much more satisfaction from being able to identify with a group of people, establish credibility with them, and enable them to reach their God-given vision. We have been privileged to have these types of relationships in the town of Muna, where we worked for three years in our previous term, in the town of Ochil, where we have been able to track with the people from the very beginning of their fellowship, and, next week, we get an opportunity to continue another long-standing relationship in the town of Oxcum. Still in the middle of this hopelessness, a light is beginning to shine. 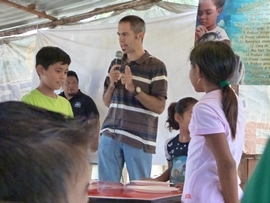 Since 2010, Pastor Ruben Sanguino has been ministering from his mission in Oxcum. 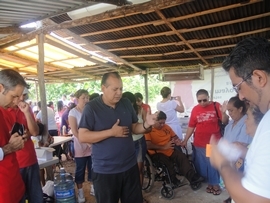 We’ve worked with him, first coordinating an outreach in 2011, and later giving a conference on the Holy Spirit. We’ve tracked with him as his congregation has grown, carving out a place and an identity in that town. And while he has seen his share of difficult times, his perseverance is bearing fruit. This October 18th, we have the opportunity to work with him again, this time in coordination with the students from my evangelism class at “Instituto Bíblico Bethel.” On that Friday afternoon, we will coordinate with his mission to speak of the God who sees their situation. We’ll be coming near through social outreach to children and adults alike, providing spiritual counseling throughout the event and a message from God’s Word in the closing rally. Our desire for this event is to raise awareness within the village of who the God of the Bible really is, and highlight the mission in Oxcum as a resource for establishing a relationship with Him. Would you pray for us as the event draws near? Pray for a favorable response from the authorities who would grant us the public space for the event. Pray for all of the details that go into the organization of such an event, from the supplies, personal, and equipment, to the message that will be delivered in word and in deed. Pray for favorable weather so that all may be able to hear the message that we are sharing. 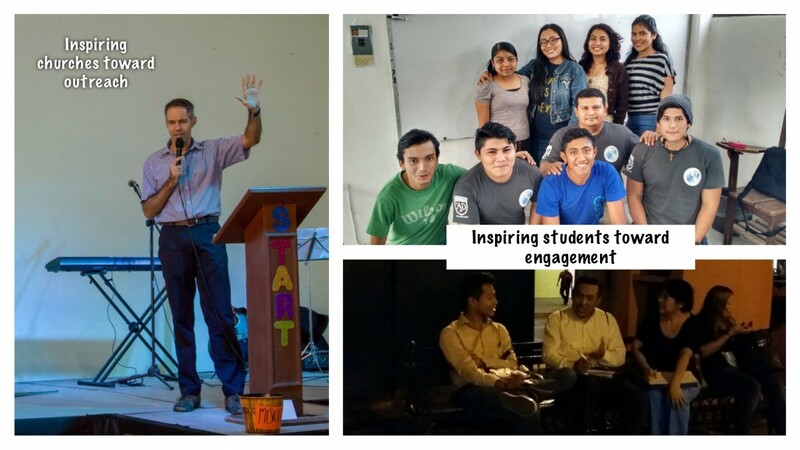 Pray for an enthusiastic coordination between the local mission members and the students of “Instituto Bíblico Bethel” as they work for the common goal of sharing God’s love with the people of Oxcum. 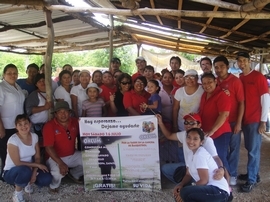 Blessings on you as you continue to stand with us in the work here in the Yucatan, and beyond! Want to learn about the Yucateco Rhythm and why it needs to pick up the pace? Hit the link here or click on the picture to find out! While you’re there, don’t miss the rest of our latest quarterly update from the field! 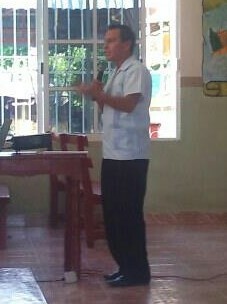 In a previous post, I had spoken about how Abimael Borbolla, District Superintendent of the Mexican state of Oaxaca, woke up the pastors and executive committees of the District of Yucatan when he alerted us that the our rate of growth, what he called the “Yucatecan Rhythm”, has been limited to 2.7 churches per year. Granted, any growth is progress, but we need to take several things into consideration when we analyze this growth. 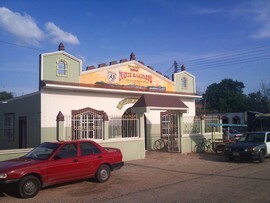 First of all, records show that there are 188 Assemblies of God churches in the Yucatan. It is generally believed that the average church hovers at a attendance of between 75 and 100, which means that there are 18,800 people entering our churches during any given week. Adding 2.7 churches to this figure yearly, we can see that the Assemblies is adding 270 people per year in a best-case scenario, a growth rate of roughly 1.5%. When we compare this growth with population figures we see the stark reality. As of the the 2010 census the state of Yucatán boasted 1,955,577 inhabitants(1). At 18,800 congregants, that means that the Assemblies is currently reaching less than 1% of the people of this state. Furthermore, knowing that the population is growing at a rate of 1.6% annually(2), our growth rate of 1.5% means that we are actually losing ground. So the logical conclusion is that, if we plan to see the Great Commission fulfilled in the state of the Yucatán, we need to get busy planting churches. Nevertheless, increased activity alone will not insure the success of this endeavor. Our vision must be to plant churches that do more than survive, they must thrive, starting a cycle of reproduction that will effectively disciple the population. The dissemination of that vision is the goal of the current series of Church Planting Training Seminars during the months of April through June. Together with Abel Can, and Fernando Diaz, District Missions Director and Secretary-Treasurer of the Missions Committee respectively, along with missionaries Lidia Pompeyo, and Norma Uitzil, we’re attempting to introduce pastors to effective methods of church planting. The 5-hour conference covers such subjects as the role of intercession, the responsibilities of the mothering church, the necessity of understanding the community, strategies to use to gain entrance into that community, and the elaboration of a chronological plan which ties all of the elements together. Our desire is to stimulate the district on toward the goal of planting 100 new churches in the next two years. We’ve held one conference in the series already, which was well attended and received. Pray for as we travel and teach the series this weekend and throughout the next two months. 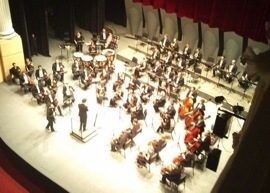 Pray also that it will result in being the shot in the arm that the “Yucatecan Rhythm” needs. Click here for more photos of the event. (1)“Mexico en Cifras”. INEGI. Retrieved May 8, 2011. 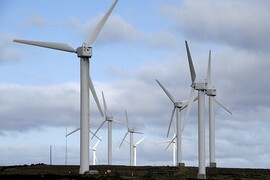 (2)“Mexico en Cifras”. INEGI. Retrieved May 8, 2011. In this previous article, I spoke of the inconvenience of power outages. I related the frustrations that I felt because I could not trust that I would have the energy that I needed to power the modern devices that I’ve come to depend upon in order to complete my projects. More recently, however, I’ve grown aware of an even more alarming power outage, evidenced by the diminishing number of believers being baptized in the Holy Spirit. 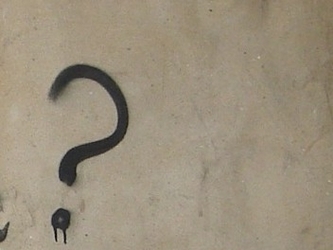 At a recent meeting, certain pastors lamented that only 20% of their congregations had experienced the Baptism, while a census submitted by the regional presbyter in the southern portion of the district reported that perhaps only tithe of the church members polled had received the infilling of the Holy Spirirt. Acts 1:8 states, “But you will receive power when the Holy Spirit comes on you; and you will be my witnesses in Jerusalem, and in all Judea and Samaria, and to the ends of the earth.” Could it be that the reason for the stagnated growth of the Assemblies of God in Yucatán has been because we’ve lacked the power that such growth requires? One church, Eben-Ezer, has recognized their need for the power that only the Holy Spirit can bring, and has asked that I speak in a two day event titled, “Reconciling Ourselves with the Holy Spirit” on February 4th and 5th. In this event, it is my desire to show the congregation the biblical foundation the Baptism of the Holy Spirit so that they might be open to receive it and learn to cooperate with the third person of the Trinity to make an impact in their daily life. Would you pray with us for these services? Pray for a genuine recognition of the need among the congregation. Pray that many will be open to learn about and receive the Baptism of the Holy Spirit. Pray that the experience would lead to a renewed witness to the community of the love of Jesus Christ. Pray that the effects of this event would motivate other churches in the Yucatán to emphasize the Baptism of the Holy Spirit. There is just something about harmony that makes things special. In music, it fills the spaces; it adds depth and color. What might be impressive as a solo piece becomes something positively majestic when instruments and voices blend together in perfect harmony. In ministry, it is just the same. We celebrate the accomplishments of the individual, but we strive to see the all the members of the Church working together in unity. While God can do much through the efforts of one surrendered heart, what can be accomplished when an entire community of believers makes itself available to be used by Him can be truly staggering. This is the type of harmony that I believe we can achieve here in the Yucatan in the area of church planting. We’ve spoken already of the ministry of church planting that we are undertaking in coordination with the Jesus Film in the Maya language, a ministry designed to plant new, indigenous works in unreached areas. Now, we are seeing others join the vision of expanding the influence of the Kingdom of God as the District of Yucatán promotes the planting of reproducible churches. 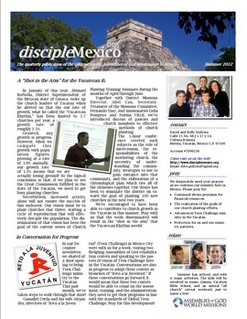 Durning the month of January, district officials have invited Abimael Borbolla, the district superintendent of The Mexican state of Oaxaca to tour through the state of Yucatan and to challenge church leaders to look beyond their four walls, to reach out into unreached areas, and to plant new works, new works designed to grow and plant others. The picture he painted was challenging. Since 1943, the birth of the Assemblies of God in Yucatán, 188 churches have been founded and sustained. When we compare these numbers to the 3,363 cities, towns, and villages that exist in our state, we find that only 6.5% of its inhabitants have access to the message that we preach. (Actually, the actual percentage would be lower as certain cities have more than one A/G church.) What is more sobering is that, at our current growth rate of 2.7 churches per year, we would not be able to finish the task of establishing a congregation in each location until the year 3258. Nevertheless, I left the conference full of hope, not from the view of the enormity of the task, but from the comprehension of what we could achieve if we work together. As he challenged those of us assembled to plant new works, Abimael showed us that, if each church would commit itself to planting just one new, reproducible church every 5 years, the task could be accomplished in only 25 years. The work is difficult but not impossible. 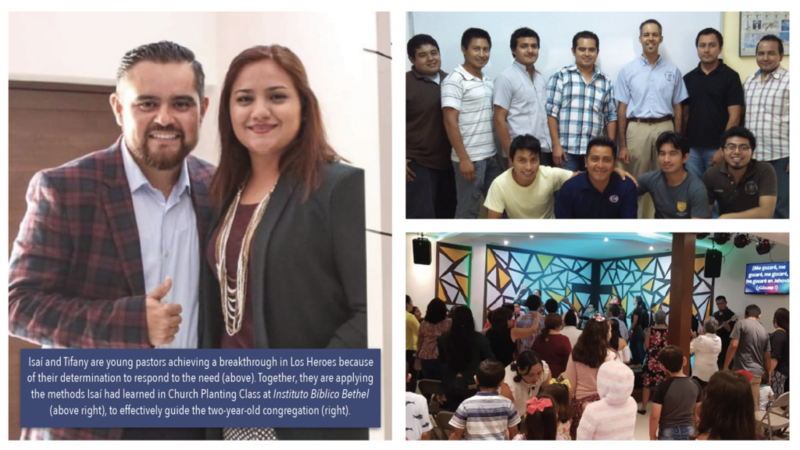 As we see a vision cast and a church respond, we are beginning to see harmony take shape, a harmony that will enable us fulfill the calling to make disciples here in the Yucatán and beyond. As I reflect on the possibilities, I’m more excited than ever to be a part of what God is doing among us.